National Security Adviser John Bolton in Israel says Kurdish militia must be safeguarded before US troops leave Syria. 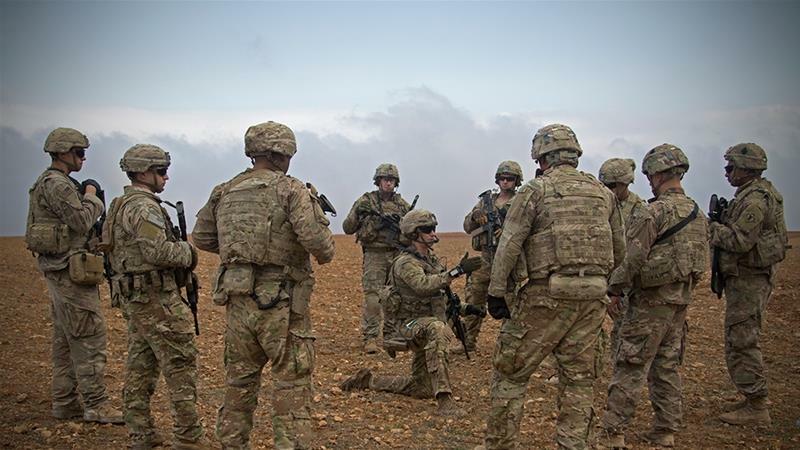 President Donald Trump's national security adviser said on Sunday the US military withdrawal from northeastern Syria is conditioned on finishing off the armed group ISIL and on Turkey assuring the safety of Kurdish troops allied with the United States. John Bolton, who travelled to Israel to reassure the US ally of the Trump-ordered withdrawal, said there is no timetable for the pullout of American forces in northeastern Syria, but insisted it's not an unlimited commitment. Those conditions, he said, included the defeat of remnants of Islamic State of Iraq and the Levant (ISIL, also known as ISIS) in Syria, and protection for Kurdish militias who have fought alongside US troops against the group. "We don't think the Turks ought to undertake military action that's not fully coordinated with and agreed to by the United States at a minimum so they don't endanger our troops, but also so that they meet the president's requirement that the Syrian opposition forces that have fought with us are not endangered," he told reporters. Bolton was deployed to Israel to allay concerns about President Donald Trump's decision to withdraw troops from Syria and discuss the process with Turkish officials. The pullout announced last month was initially expected to be completed within weeks, but the timetable has slowed as the president acceded to requests from aides, allies and members of US Congress for a more orderly withdrawal. Bolton's comments mark the first public confirmation that the withdrawal has been slowed. He met Israel's prime minister, Benjamin Netanyahu, and other officials on Sunday before travelling to Turkey. Israeli officials have expressed concern that a swift withdrawal of the roughly 2,000 troops could enable Iran to expand its influence and presence in war-torn Syria. "There is a great concern among US allies in the region about what is the next step," said Yossi Mekelberg, professor of international relations at Regent's University London. "The Trump administration's message is completely incoherent. On the one hand, the Trump administration is talking about more pressure on Iran vis-a-vis the nuclear issue. But the withdrawal leaves Syria open to Russia and Iran," he told Al Jazeera. Trump's move has also raised fears about clearing the way for a Turkish assault on Kurdish fighters in Syria who have fought alongside American troops against ISIL. Turkey considers the Kurdish People's Protection Units (YPG) a "terrorist" group linked to Kurdish fighters within its own borders. "Top on Turkey's list is the disarmament of the Kurdish YPG fighters," said Al Jazeera's Mohammed Adow, reporting from Gaziantep on Turkey's border with Syria. "Turkey wants them disarmed and removed from the areas near its border with Syria. Turkey also wants logistical and air support from the US, once the troop withdrawal is complete. Turkish officials will want John Bolton to come up with a clear timetable for withdrawal." Bolton also warned Syria's president, Bashar al-Assad, not to use the US withdrawal as a pretext to use chemical weapons against Syrians, saying there is "no change" to the US position that their use is a "red line". Trump has twice carried out air attacks in Syria in response to alleged chemical attacks with the intention of deterring Assad. "We've tried twice through the use of military force to demonstrate to the Assad regime the use of chemical weapons is not acceptable," Bolton said going to Israel. "And if they don't heed the lessons of those two attacks, the next one will be more telling." Trump's announcement about the intended troop withdrawal was greeted by surprise and condemnation from many members of the US Congress and allies, and prompted the resignation of then-defence chief James Mattis in protest. Secretary of State Mike Pompeo is following Bolton to the Middle East this coming week for an eight-country tour of Arab allies to shore up support for the administration's partners in the region. The chairman of the US Joint Chiefs of Staff General Joseph Dunford will join Bolton in Turkey. In meetings with Turkey's President Recep Tayyip Erdogan and other officials, they are expected to warn against an offensive targeting the Kurdish fighters in Syria.